FOX—the industry-leading ride dynamics company—sponsored rock racer, Erik Miller, wins his first King of the Hammers, becoming one of three FOX drivers to win the race since its inception five years ago. FOX now has four of the five titles to its credit with Shannon Campbell's two wins in 2008 and 2011, and Jason Scherer bringing home the win in 2009. Erik Miller crossed the finish line after 6 hours of controlled chaos besting second place by nearly thirteen minutes. Miller previously finished fifth in 2010, fourteenth in 2011. The win-defining choice that attributed to his 2012 victory was his decision to purchase a set of FOX Bypass shocks and Coil-overs from his local dealer. 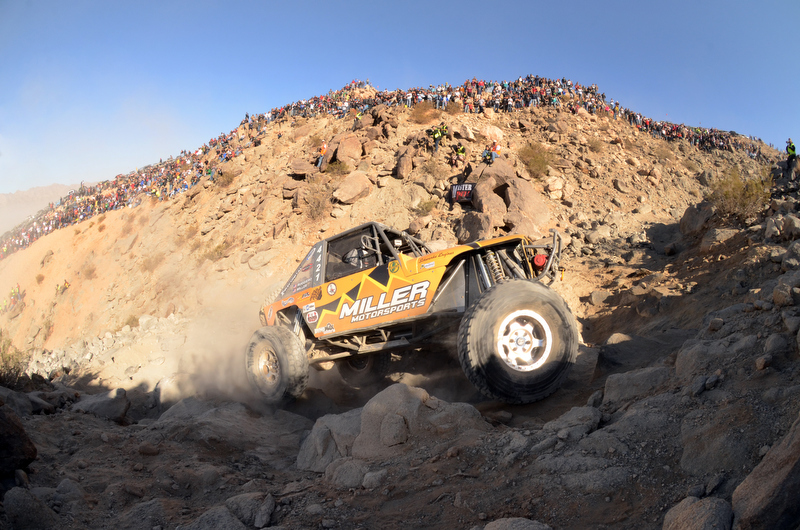 The 2012 edition of King of the Hammers (KOH) was the largest yet, drawing 134 competitors and thousands of spectators from across the globe to Johnson Valley, CA. As the event grows, so does the caliber of the competition and level of suspension technology to gain that competitive edge. KOH is a unique race in that it combines two disciplines of racing from both ends of the offroad spectrum, and everything in between, to pit man and machine against the most extreme, natural terrain the Mojave Desert has to dish out. To finish strong—let alone win—teams must design their vehicles for optimum performance in the methodical and meticulous rock climb sections for the long, wide-open sections where they reach break-neck speeds of up to 120mph. This is where an intimate understanding of the wide range of terrain dynamics is crucial to getting a perfectly tuned suspension system for the driver's vehicle is a distinct advantage. With every vehicle having its own distinct characteristics, there is no one-suspension-fits-all solution. FOX redefines ride dynamics for ATVs, mountain bikes, motocross, off-road vehicles, snowmobiles, trucks and UTVs. In 1974, Bob Fox redefined the world of motocross suspension with the FOX AirShox, and for more than three decades, FOX's team of enthusiasts and professional athletes have been uniquely committed to redefining ride dynamics that improve your performance. Headquartered in Scotts Valley, Calif., FOX's main manufacturing operations are in Watsonville, Calif., its off-road division and manufacturing are in Santee, Calif., and its Midwest Service Center is in Baxter, Minn. FOX distributes its products in more than 40 countries.